Spark Mandrill's level can be somewhat of a pain. You'll be doing a lot of dodging and, if you play the level enough times, learning where to pre-fire to be able to take on some extremely fast enemies. 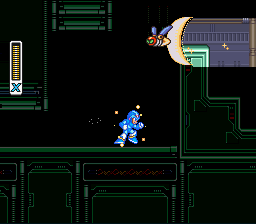 Keep going to the right until you encounter a familiar foe: the missile shooting robot from the opening stage. Destroy him and proceed up the ladder, but before you reach the top, notice the sparks that travel along the ground. If they hit you, they'll take your hit points away, so time your movements and keep going forwards. Eventually, after facing many of those missile shooting robots and annoying sparks, you'll reach the top of the area. Move on into the next room and the lights go out... great. This is yet another annoying part of the stage. Either jump over or stay under the fireflies when necessary. These very fast fireflies will attempt to kill you each time to try to jump over a pit. The best way to get over them is to just jump over the firefly as well by doing a dash jump, or in some cases, you can stay on the wall as they pass over you. During this part you'll also encounter those bird robots that shoot sawblades, so be sure to make quick work of them. 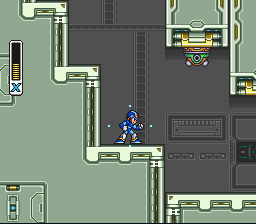 Once you get to the end of this area, climb down the ladder and into a small room, where you'll face a sub-boss. Dodge the bubbles and lightning bolts! Weakness: Storm Eagle's Storm Tornado. For some he can be easy, but for others this fight will be hard. 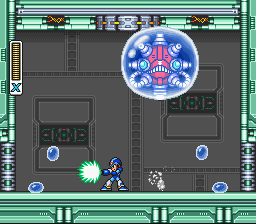 Its main form of attack is to launch four bubbles that on contact will make you unable to move. However, they're easy to dodge and if you are stuck in one just keep dashing to get out of the bubble and the boss's way. While you're stuck, it will attempt to shoot quick lightning bolts at you, so be sure to stay away from it when he does. Occasionally, it will also try to crash into you, so just dash out of the way if it does. Just keep delivering charged buster shots and staying out of the bubbles and the fight should be a piece of cake. If you've beaten Storm Eagle already, it won't shoot lightning bolts, making the battle even easier. Just keep destroying the robots that plague this area. When the sub-boss is destroyed, proceed out of the dungeon and into the next area, where you'll have to face some strange tire-shaped robots and blasters that are attached to the ground and floor. 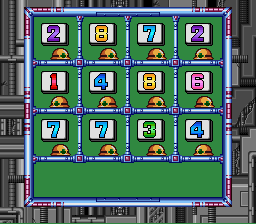 At the end of this area you'll encounter a turtle robot that shoots missiles out of its shell, but they can be destroyed quickly with a fully-charged Buster shot and jump shots. 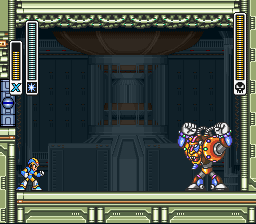 The spot noted by Mega Man is most desireable as the initial launch point. After killing the turtle, but before heading down the ladder, climb up the wall and you'll see a Heart Tank sitting there. You'll need to have the Leg Enhancement to get it, so hopefully you've been following this guide! Simply perform a wall dash while you're scaling the wall, then quickly jump on the ledge with the heart tank on it. Climb up and collect your prize. 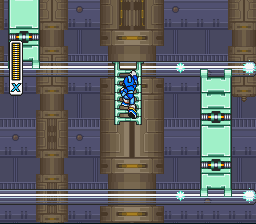 Eventually, you'll encounter a similar area with more tire robots, blasters, and turtle robots, but with more ladders. Once you get past that part, you'll have to deal with the lights going out and those annoying firefly things again, so proceed with caution. 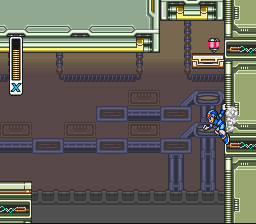 At the end of this place you'll find the boss room entrance, so equip your Shotgun Ice and get ready to fight Spark Mandrill. 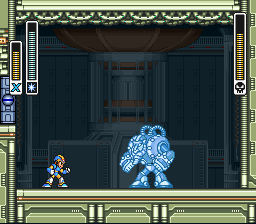 Although it looks intimidating, this fight will be extremely easy if you have its weakness: Shotgun Ice. Once it lands, just shoot it once and watch as it is frozen in place. Don't shoot it again: wait until he breaks free and then shoot it. 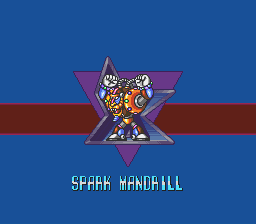 Spark Mandrill has two basic attacks: two electric sparks that travel around the room (they can be jumped over) and a charge punch (just freeze it quickly or scale the wall). It will occasionally climb on the ceiling, but you can just shoot the Shotgun Ice at the wall and have it bounce back, hitting it and freezing it in place yet again. Just keep using S. Ice and the Mandrill should be gone in no time. Immediately shoot as soon as the fight begins. Just keep freezing him and he'll be destroyed in no time. Electric Spark! This shoots a purple spark that does a good amount of damage. If a projectile hits a wall, it will separate into two smaller but equal sparks that travel along the wall vertically in opposite directions. It can also be fired very quickly, and will come in very handy for the next boss battle. This page was last edited on 2 January 2019, at 21:23. This page has been accessed 214,253 times.